Trevor Noah, the new host of The Daily Show, used the October 5th episode as a platform to make nauseating points about Republicans on abortion and gun control. The Daily Show’s website proudly advertises the segment with the words: HOW PRO-LIFE ARE PRO-LIFERS? Mic.com gushed about the episode. 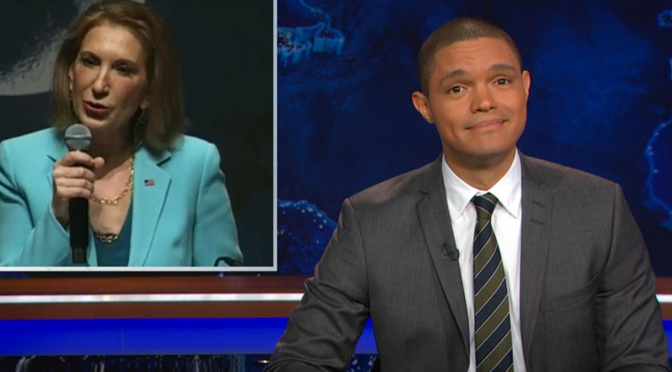 “Trevor Noah Called Out GOP Hypocrisy on Planned Parenthood in His First Great TV Moment,” reads their headline. It’s truly amazing how much the pro-lifers have been able to accomplish in the anti-abortion fight. Just imagine what they could do with an issue where the facts are actually on their side. It is truly amazing what we have been able to accomplish, especially since pro-abortion president Barack Obama will be in office until 2017. More importantly though, the facts are on our side. Basic biology dictates that life begins at conception, in that a unique being who has not existed before and will not exist again has formed. Mic makes the connection between facts and videos from the Center for Medical Progress alleging that Planned Parenthood is illegally profiting from the sale of baby parts. Carly Fiorina has particularly been hit hard by Planned Parenthood and the mainstream media, even though footage backs up her claims that babies are being harvested while still alive. The unedited version is even more clear on this. Yes, yes. That is such a deep thing to think. But what other issue could appeal to those who love life? The segment then has a clip from CNN, which quotes the Brady Campaign to Prevent Gun Violence, an anti-gun group. The clips mentions that in 2012 there were 97,000 people shot, which is over 250 per day. This is people shot per day, not actually killed. And in 2014, Pro Publica pointed out that we don’t actually know if there is an increase or decrease in nonfatal gun violence. It’s curious that Noah would talk about facts and then cite such statistics. Not mentioned are the abortion figures for the same year. Let’s just go with the annual 97,000 shootings (250 per day) figure from the Brady Campaign, for the sake of comparisons. In 2012, there were an estimated 1.02 million abortions. However, Abort73.com points out that the exact number is not known, since some states do not report their abortion statistics. Using this figure of 1.02 million abortions a year, though, that’s 2,794 abortions per day – ten times greater than the shootings. It’s also worth examining the numbers from Planned Parenthood, the nation’s largest abortion provider, which Noah and Mic are so excited to defend. Planned Parenthood’s 2012-2013 annual report showed that they performed 327,166 abortions. That’s over 896 abortions a day. Thus, no matter how we look at it, the abortion figures are still much, much higher than gun figures. He then showed a clip of Jeb Bush’s “stuff happens” comments with regards to the recent shooting at a community college in Oregon. Bush has been sharply criticized, but as The Federalist points out, many have not looked to the full context of his statements. The point is, if pro-lifers would just redirect their power toward gun violence, the amount of lives they save could reach superhero levels. They just need to have a superhero’s total dedication to life. Because right now they’re more like comic book collectors: Human life only holds value until you take it out of the package, and then it’s worth nothing. Accusing someone of being pro-birth seeks to attack the other side, without examining how the accusing side still advocates for the brutal death of babies from inside the womb. Regardless of whether pro-lifers can do a better job caring for people after they’re born, how does the accusation make the pro-abortion position any better at all? It doesn’t. It’s also ridiculous to say that pro-lifers should care about this issue more, or about that particular one. Abortion and gun violence are separate topics. We have people who focus their attention on one and people who focus their attention on another. In the same vein then, shouldn’t we be criticizing the people who work to stop gun violence for not doing enough to help the preborn? Mic and others can gush about Trevor Noah all they want, but if this is how he proudly begins his stint as host of The Daily Show, it could be a long stretch.